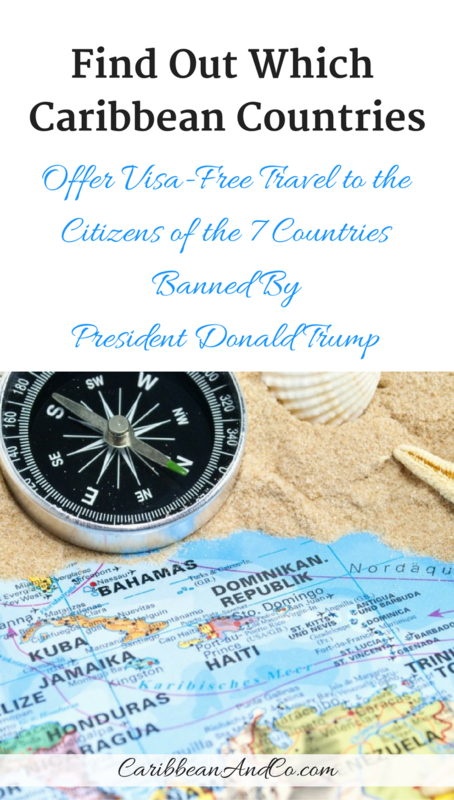 Find Out Which Caribbean Countries Offer Visa Free Travel to the Citizens of the 7 Countries Banned By President Donald Trump - Caribbean & Co. Seven days after moving into the White House, President Donald John Trump issued a controversial executive order since struck down by the federal courts banning all citizens of Iran, Iraq, Libya, Somalia, Sudan, Syria, and Yemen from entering the United States even those with legal visas and Green Cards who happened to be out of the country. Curious about whether or not Caribbean countries provided visa free travel to citizens of these seven Muslim-majority countries, we reviewed the recently updated Passport Index™. From the Passport Index™ which ranks 199 countries and territories that issue passports, we were able to uncover that very few of these countries — all with low visa-free scores — have visa-free access to Caribbean countries. In fact, only Haiti provides visa-free travel to citizens of all seven countries. St Vincent & The Grenadines offers visa-free travel to citizens of four of the countries including Libya, Somalia, Sudan and Yemen. For the citizens from all seven countries who visit Dominica, they apply for a visa on arrival. The full breakdown for the sixteen independent Caribbean countries follows. Caribbean countries that are dependent territories of France (Guadeloupe, Martinique, Saint Martin, Saint Barthélemy), the Netherlands (Aruba, Bonaire, St. Eustatius, Saba, Curacao, St. Maarten), the United Kingdom (Anguilla, Bermuda, Cayman Islands, Montserrat, Turks & Caicos, British Virgin Islands), and the United States (Puerto Rico, US Virgin Islands) follow their lead, and none provide visa free travel. All require citizens of these seven countries to apply for a visa in advance of their trip. Curiously absent from the ban were citizens of the following Muslim-majority countries Afghanistan, Egypt, Indonesia, Lebanon, Pakistan, Saudi Arabia, Turkey, and the United Arab Emirates (UAE) all of whom have had issues with terrorism. In particular, Egypt, Lebanon, Saudi Arabia, and the United Arab Emirates as the executive order made numerous references to 9/11, and the nineteen hijackers were citizens of these countries — fifteen of whom came from Saudi Arabia. Some suggest that these countries were left off due to President Trump’s current business relationships. Whatever the case, here too we wondered about which Caribbean countries provided visa free travel to citizens of these eight Muslim-majority countries. Haiti again is the only country that provides visa free travel to all eight countries. St Vincent & The Grenadines provides visa-free travel to all except Lebanon citizens. Turkey overall was the biggest beneficiary with either visa-free travel or visa on arrival to all but three of these independent Caribbean countries. When we look at Caribbean countries that are dependent territories of France, the Netherlands and the United Kingdom, only citizens of the United Emirates benefits from visa free travel. All the others require an approved visa. The United States which has dependent territories Puerto Rico and US Virgin Islands does not provide visa free travel to citizens of any of these countries. Truth be told, the findings are not surprising as in reviewing data from the Caribbean Tourism Organization, Middle Eastern tourism figures are not broken out. This is because while high net worth individuals from some of these Muslim-majority countries do apply for a second passport via the 5 Caribbean Citizenship By Investment Programs, for regular tourism, it’s simply not a primary source market due to the distance and visa restrictions.